Do you ever have those seasons where it feels like the whole world opens up and gives you green lights…all at the same time? We are in a ‘go-time’ right now, and honestly, we’re just trying our best to keep up, while we meet all of our commitments and have some fun along the way! Last weekend was no joke, but we made it out alive. The most glamorous and enjoyable moment was when we walked the red carpet at the 2017 Emmy Awards! 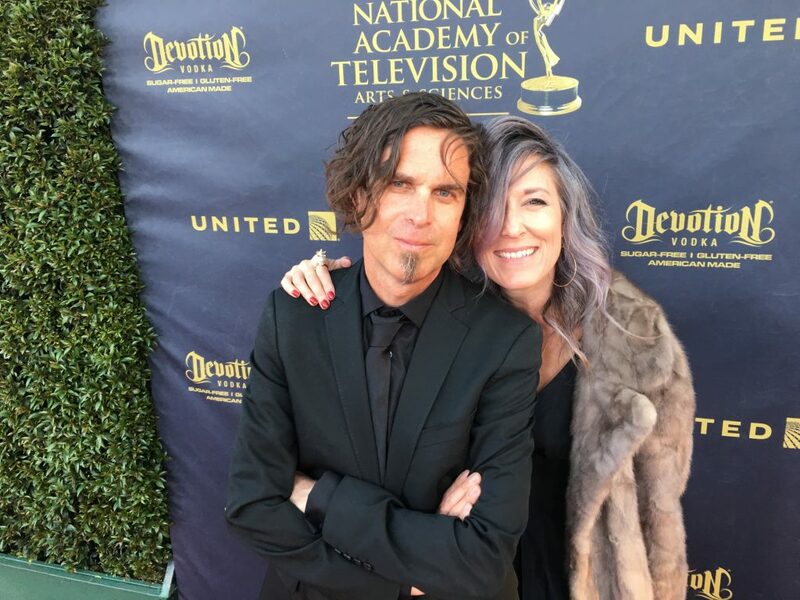 Bobby and his co-writer, Daena Jay, were nominated for an Emmy – Best Original Song – Daytime. This was the second nom in a row for this songwriting team. They didn’t take home the award this year, but we certainly had fun celebrating all things music and television. But, before we threw on our fancies, Bobby and I went over to IPME, and bought ourselves a brand new shipping container. 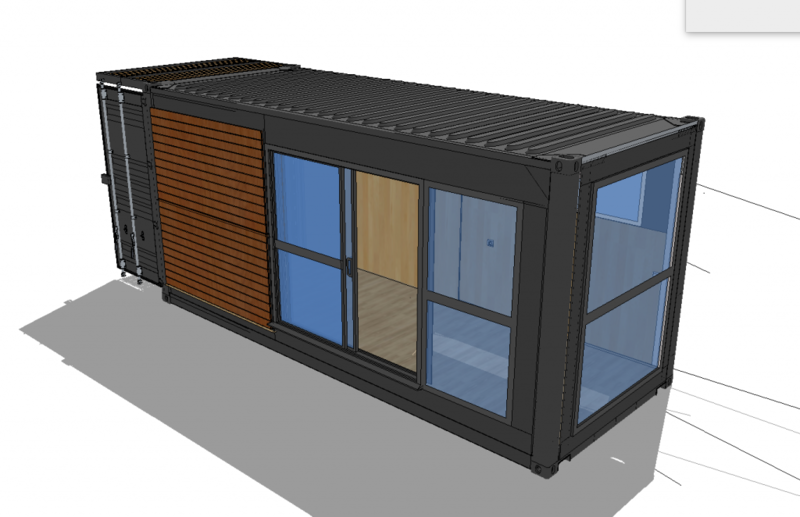 Yes, a shipping container. You know, the big steel boxes that travel around the world on freight liners. A container that will be delivered into our yard in three weeks. The yard that is right next to our house. Where the shipping container will stay forever and ever. I’m a little timid about the idea. Does it show? More sketches and pictures of the container mod to come. 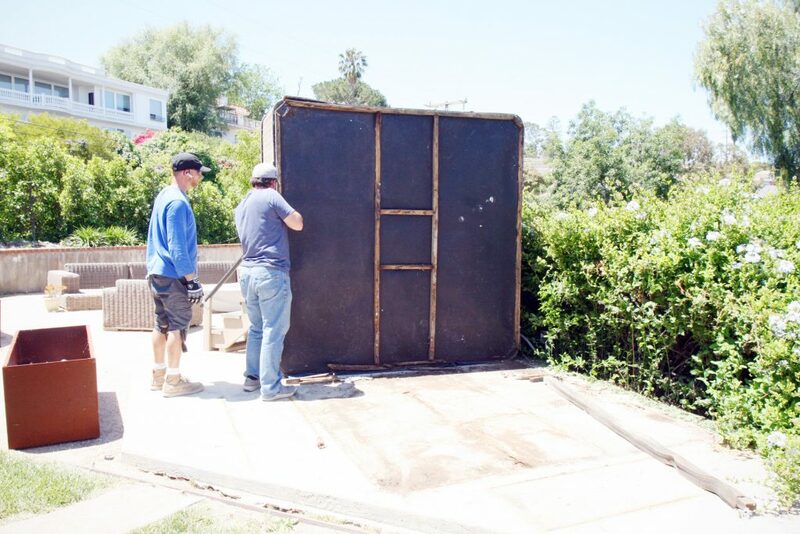 But in the meantime, we needed to make room in our aforementioned yard for the container. 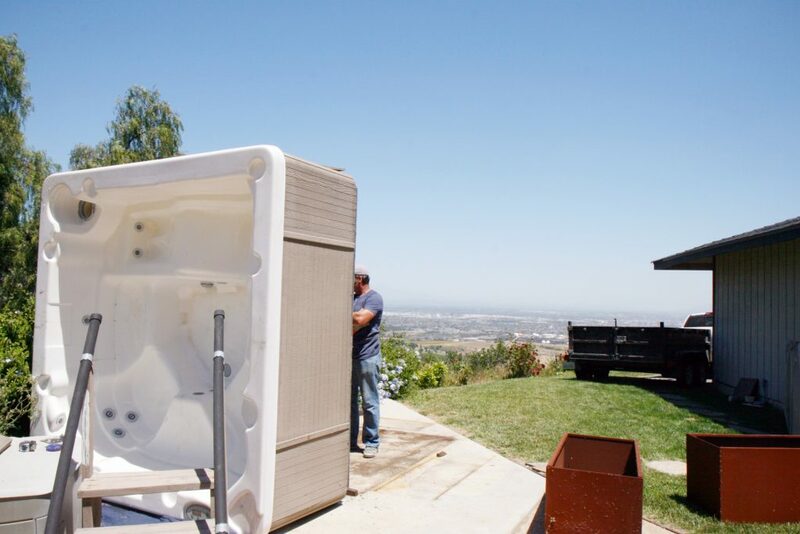 It’s landing place was occupied by an above ground jacuzzi…so we had to find a new home for the spa asap. 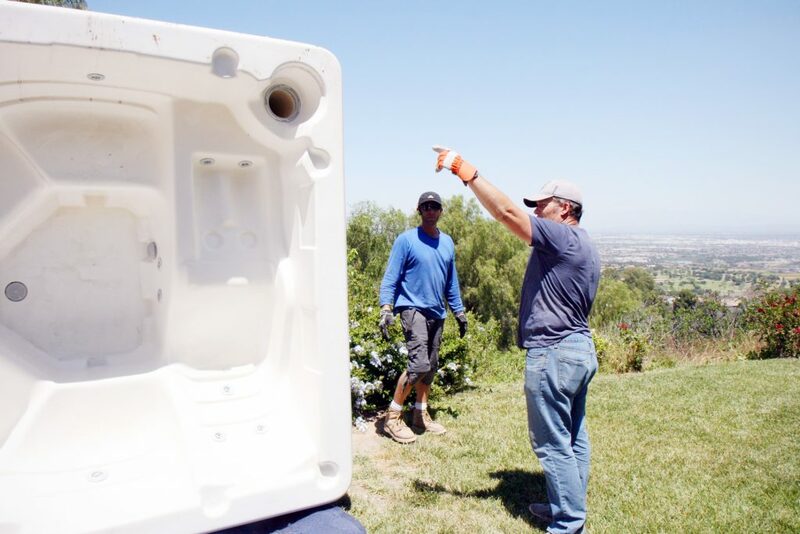 Thankfully, our friends Tom and Christy were looking to add a jacuzzi to their backyard. And within a matter of days, Tom brought his friend Tulio over to tackle the transport. Upon close inspection, there was some termite damage to the bottom frame. Tom will have to build a new frame before installing it over at their house. The guys stopped to have a brain storming session about how to get the jacuzzi from here, into the truck. Seems it was just a smidge too heavy to carry. I’m pretty sure I was sipping on a nice glass of rose at this moment. As the guy’s were finishing up, I looked at the space that the 8 foot-wide truck was sitting in, contemplating the 8 foot-wide (and 9’6″ tall) shipping container that would soon fill the space. And I noticed something…. 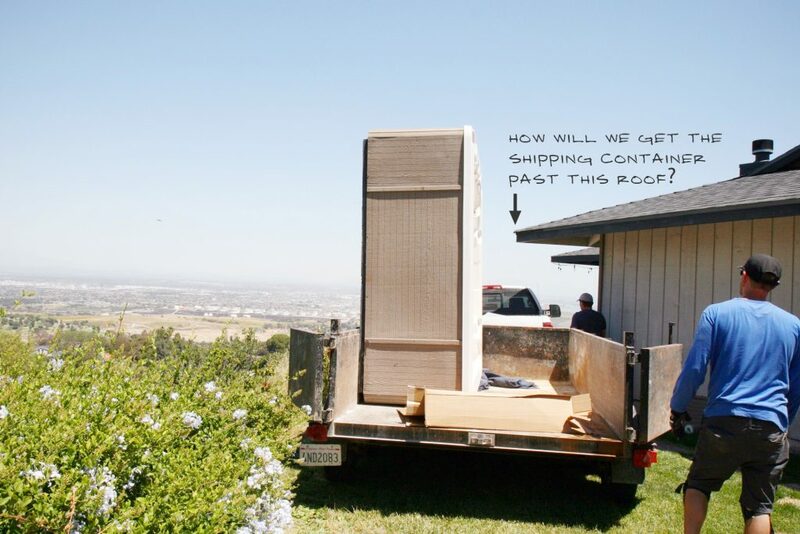 As you can see from this angle below, there isn’t a whole lot of wiggle room when it comes to getting the container past the roof…and not tipping down the slope. (And no, it can’t be crained in…we’ve got above ground telephone wires…thanks a lot Palos Verdes). Rest assured, pictures have been sent to people far smarter than I. I’m confident there is some three-armed container lift or some other monster that will handily solve this delivery problem. Right!? 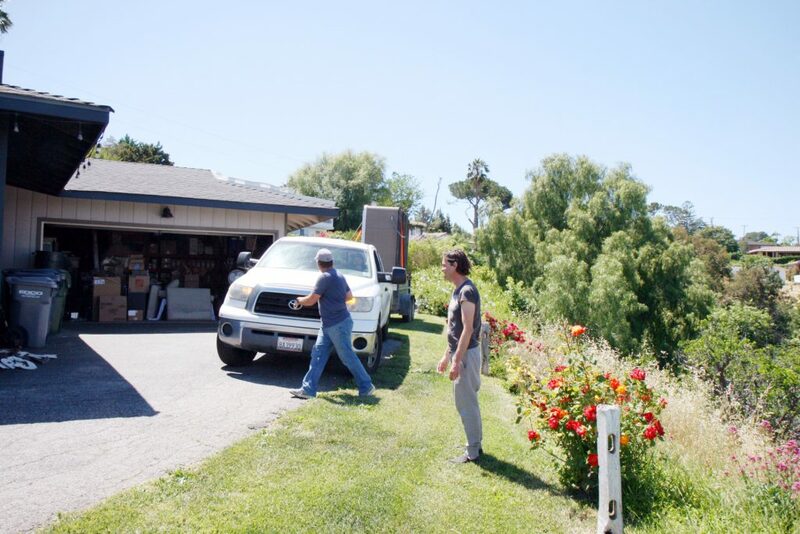 The only issue after that will be for anyone who wants to remove the container…because this driveway will be long gone, and replaced with a cement patio that sits about 3 feet higher than the ground. Nothing to worry about here. Just breathe. It will be fine. 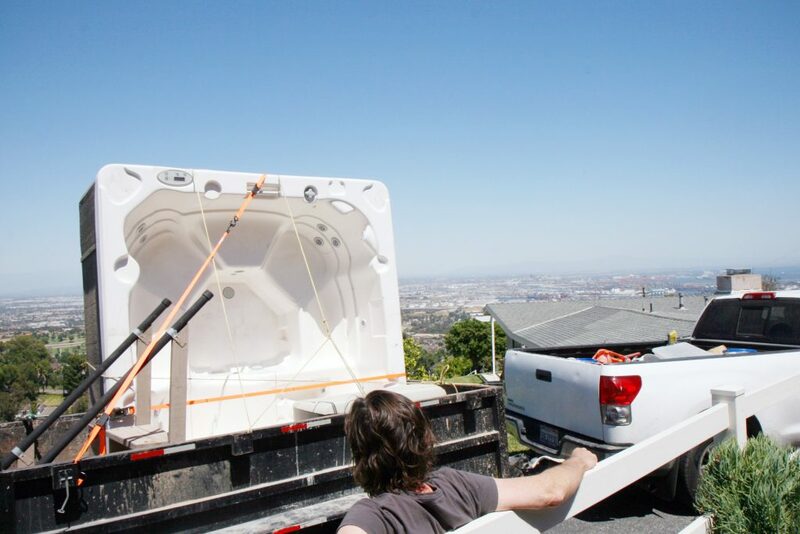 And with that…off goes the jacuzzi to Tom and Christy’s for a new life! Well, obviously, going to the Emmy’s was the best part of the weekend, but still, there was something thrilling about pulling the trigger on the container, and beginning to get the space ready for it. 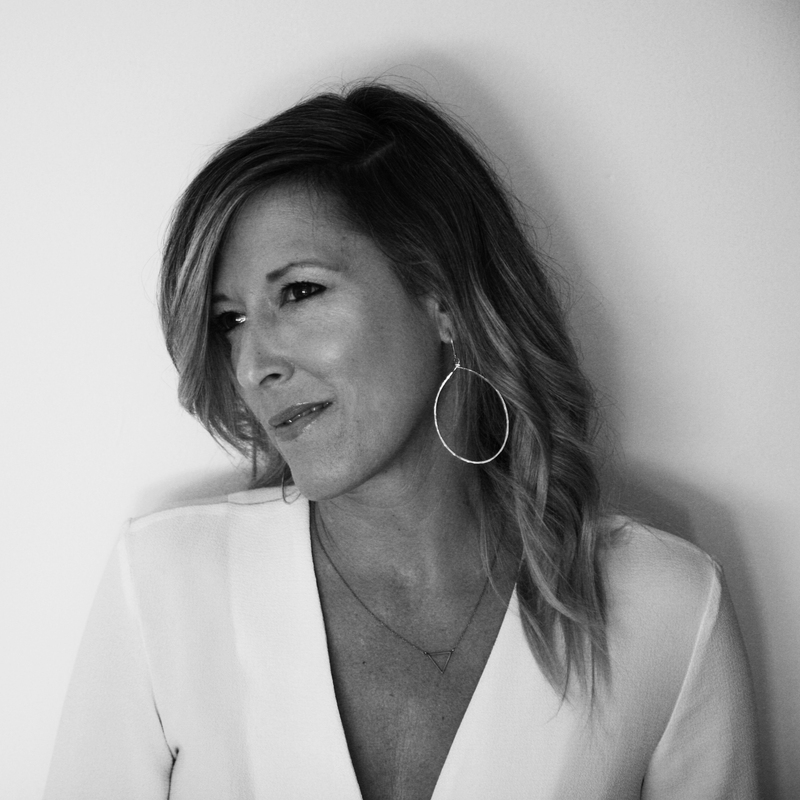 I have a feeling the next few months are going to be a site to see….stay tuned!